Tool Blog Hot Deals Win a free JET Woodworking Shop. 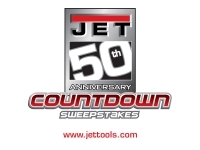 In celebration of JET tool being 5o years old this year, they are holding a tool sweepstakes giveaway once a month for the entire year. Then a grand prize giveaway, and a great ending if you ask me, at the end of the year consisting of an "Ultimate Work Shop". This months giveaway is a parallel clap set. Next months giveaway is a Pro Shop Tablesaw. JET has some free stuff to hold you over. Plans for an adirondack chair and arbor, screen savers and more. You dont want to miss this. For complete contest rules, and to sign up yourself, head on over to the Jet Tools website .